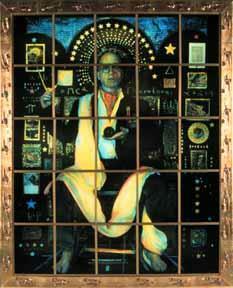 Rational Being is the central image in a series of five "stained glass windows" created by Kathleen Campbell, entitled Modern Theology Or a Universe of Our Own Creation. As in "It's All About the Apple, Or is it?," the "Or" in her title suggests alternatives to theological conventions. Constructed of Duratrans, a photo-based and mass produced material used in commercial applications (such as back-lit Kodak advertisements found in most camera stores), Modern Theology queries the conflation of commerce, science and spirit while infusing a beatific light that suggests redemptive possibilities. In Rational Being, a man in priestly (or academic) robes holds a compass and a ruler, symbols of mystical geometry and human technology. Like The Constructor, a self-portrait by the Russian constructivist artist El Lissitzky made in 1924, Campbell's image is a paean to science and industry. But unlike the former image, which valorizes the artist's eye by superimposing it over the mind, in Campbell's case it is rationality alone that is enshrined: She says, "Here is a metaphor for the all-powerful, rational, scientific 'Man" who, since the Renaissance, has gradually usurped the role of the Divine and created the universe in which we now must live. . . . Here is a world filled with wonders - our own artificial 'Nature' - entirely man-made and self-sufficient." The implications of Campbell's pronouncement are not facile nor clear-cut. As art historian Jolene Rickard notes, this work "crosses the cultural divide in the Americas, seeking a relationship to nature. Her work is an interrogation of modern science and Christianity while it simultaneously acts as a site for the integration of alternative ways of knowing." In Campbell's own words, her symbols "touch on the conflicts between the reality of our everyday lives and the universal longing for transcendence. Heaven is always just outside our reach. We are grounded in a disappointing materialism, forever hoping each illusion will lead us to some spiritual truth." 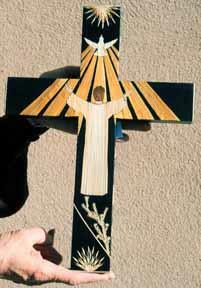 For Catherine Robles-Shaw and Diana Moya Lujan, two santeras (saint-makers) who live in Colorado and New Mexico respectively, spiritual truth can be found through faith in Catholicism and its tenets, as expressed in the traditional religious arts of the Indo-Hispano American Southwest. For example, Lujan affirms that her family has "strong religious values" and that Santos have been an "immense" part of her life. She says, "My life has been blessed by my wonderful family and now by my art. Each piece created is a learning experience. Not only am I learning new techniques, but I am learning about the Santos and a means to pay them homage." The term "Santos" refers both to the Catholic saints and to the carved and painted depictions of them. According to Dr. Helen Lucero, the word "santero" historically referred to men who made religious images in the form of bultos (carved wooden figures in the round) or retablos (paintings on wood panels) during the Spanish Colonial period (16th century). Lucero points out that women have only joined the santero tradition since the 1970s. Although this development coincided with political gains in gender equity often attributed to feminism and the 1970's American "woman's movement," Lucero looks instead to traditional Hispanic culture and says that the santera is a "new role" but one which is a "logical extension" of women's "caretaker role," a role which is endorsed by perennial Hispanic Church practices. Lucero writes, "In New Mexico, Hispanic women have long been 'the keepers of the Roman Catholic faith.' They have been responsible for cleaning the churches and stitching and laundering the garments worn by the saints' images. They have cared for the church altars and embroidered the colchas which sometimes decorate church and home altars." Thus, contemporary santeras are faithkeepers on several levels - they maintain traditional values in home and church and produce exquisite artworks as yet "another expression of their faith and devotion." Delilah Montoya uses documentary photography in El Corazon Sagrado (figures 8 and 9) to interpret the Sacred Heart, a Catholic symbol which she terms "a cultural icon . . . a spiritual icon that is embedded in the religious fabric of my culture." The "culture" to which Montoya refers is complex and rich in allusions, many of which predate Catholicism. Writing as a Chicana artist and from what she calls a "Mestizo perspective," Montoya finds connections between European Catholicism and Aztec philosophy. She says, "The Baroque Sacred Heart in the Americas is an icon that resulted from an encounter. It is not purely Indian in content and never completely European in its form. Rather it is a hybrid of two diverse cultures that clashed and bonded at a particular historic moment and created the foundation for religious syncretism." Thus the pierced and frozen beef heart that Montoya overlays with Christ's image, like the barrio "home girls" replete with graffiti, teddy bear, a woman's wink and a heart-shaped balloon, must be read as layered works that explore Chicana identity just as they seek spiritual sustenance. Can a "culture in rupture" and "models of social defiance" coexist and come to terms with Chicana spirituality? From a feminist viewpoint, one could say that a vital Chicana spiritual culture depends upon social defiance, since to reclaim one's female heritage is to resist negative patriarchal depictions. La Llorona, like La Malinche (who is included in Montoya's Sacred Heart series, see Gallery I-B, and in her Codex Delilah: A Journey from Mexichica to Chicana, see below) illustrate this point. This artist book was commissioned by the Mexican Museum (San Francisco) for the Quincentenary exhibition "The Chicano Codices: Encountering Art of the Americas," which traveled to museums throughout the US west coast during 1992-94. Designed to resemble a Meso-American codex, the book charts the story of Six Deer, a fictional Mayatec youth, who meets some of the most important women in the Chicana folklore tradition (including La Llorona and La Malinche) )during her mythic journey. However, each of these female characters tells a story of subjugation, retold through Montoya's mestizaje perspective. "As a Chicana, I am conscious of how the historical contributions of women have been undermined or completely ignored," Montoya states. "This project attempts to correct that injustice by rethinking the traditional interpretation of the European/Native Encounter." Like Delilah Montoya, Kim Stringfellow has come to terms with Catholic theology by reshaping it in her own image. 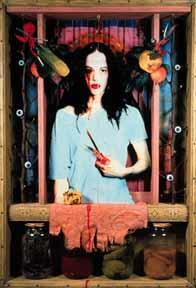 In Self-Portrait as St. Lucy, this San Francisco artist constructs a multi-referenced memento mori. Based on a 15th century Italian painting, Stringfellow substitutes herself, portrayed as a mutilated saint, in place of the Madonna and Child. She says, "That many of the Christian saints are disfigured, mutilated or raped to attain their martyrdom amazes me. 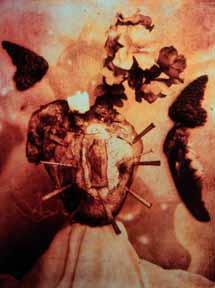 The romantic idea of suffering extensive physical, mental and self-inflicted pain for 'love' is appalling. . . . My shrine for St. Lucy represents the sickness, disease, obsession and decay particular to unrequited love." Stringfellow believes that "love can be considered the controlling principle of Art." In her most ambitious piece to date, The Charmed Horizon (a work in progress), she constructs a series of tableaux which emulate natural history dioramas and function as visual metaphors. The piece combines objects, live organisms, appropriated images and sound. Based on a passage from the surrealist poet Lautreamont's Les Chants du Maldoror, Stringfellow is concerned with "our intense yearning to merge with another," which "desire transcends all conscious and unconscious thought and is the driving force in creative obsession." Stringfellow will present this piece on the Internet at www.kimstringfellow.com/charm.html. Here we see all the poisonous rancor of jealousy. A pair of lovers gaze at each other, absorbed in their happiness, while a solitary figure, tense with anger, watches. The wallpaper and floors are warped with the force of emotion. The virgin, on the altar, covers her eyes to avoid looking at the horror of jealousy, and on the altarcloth the Sacred Heart bleeds with grief. Anita Rodriguez is an artist whose macabre paintings depict death in order to represent life. "The image of death in these settings makes the life I paint more pungent, poignant, more precious," Rodriguez states. Moreover, she notes that skeletons have been a motif in Mexican art since the Pre-Columbian era. Rodriguez traces her Mexican ancestry to her paternal grandfather, and speaks of the "sheer spiritual power and mythic impact" of Hispanic religious folk art, asking, "What child could ignore a Carreto de Muerta - a death cart?" On her maternal side, her relatives were of European ancestry. In fact, her mother was trained as an artist and painted according to European conventions. However, as a teenager, Anita traveled to Mexico City where she learned to paint in the tradition of Frida Kahlo, Diego Rivera and other Mexican artists. In her twenties, Rodriguez became an enjarradora, a traditional Hispanic plasterer who builds fireplaces and nichos out of adobe brick and mud. She traces this craft to before the Spanish conquest , and says the techniques were passed on orally, from Indian mothers to daughters. Thus Rodriguez, who has spent most of her life in New Mexico, has been influenced by a multiplicity of cultures. Some of her paintings even include references to Jewish themes and the "Crypto-Jews" or "hidden," "secret" Jews of New Mexico, who escaped the Spanish Inquisition by converting to Catholicism and then practicing Judaism in secret. Paintings such as La Posada y el Secreto depict traditional Hispanic Catholic ceremonies taking place in close proximity to Jewish ones. While one ceremony is painted on the outer nicho, on its interior, a second hidden painting depicts Jews lighting the Menorah. In a similar work, La Llorona roams the night with a Golem, a heroic character from Jewish mythology, created from clay in order to save the Jews under attack in the 16th-century Prague ghetto. "Every Hispanic child has heard La Llorona wailing at night," says Rodriguez. "Jewish children know the Golem, a clay spirit that comes to life. It seems to me that in areas where Hispanic Catholics and Jews live together, La Llorona and the Golem would also be together." (1) and (2) from "Art of the Other Mexico: Sources and Meanings,"
Mexican Fine Arts Center Museum, Chicago.